It's finally here! But I can't ride it until the homologation is completed. As soon as I have the chance I'll try to write an unbiased review (I'll try very hard....). In the meantime I'm frantically pacing up and down the passage way. What got bettered on the 2019 model? Injector, fuel-pump, rocker arm...? If it is essentially the same bike the I call this BARGAIN!! Then the last of the 2018's is the biggest bargain! Is it so? I thought the current 690 had the old engine with 69 or so HP and old head, not the same as the latest 701 that has new engine head and 75HP (and also doesn't anymore have the problem with the rocker arms as current 690 still has. Am I wrong? Also 2019 690 will have higher quality suspension from EXC range as was discussed lively here few pages back. Also new 690 has 1 liter bigger tank - not a big deal I guess. But that new engine with better suspension make 2019 690 significant improvement over current model IMO - at least on paper. Only the real world ride will tell how much this translates in practice. You mean the engine on the current (2018) model or on the upcoming 2019 one? 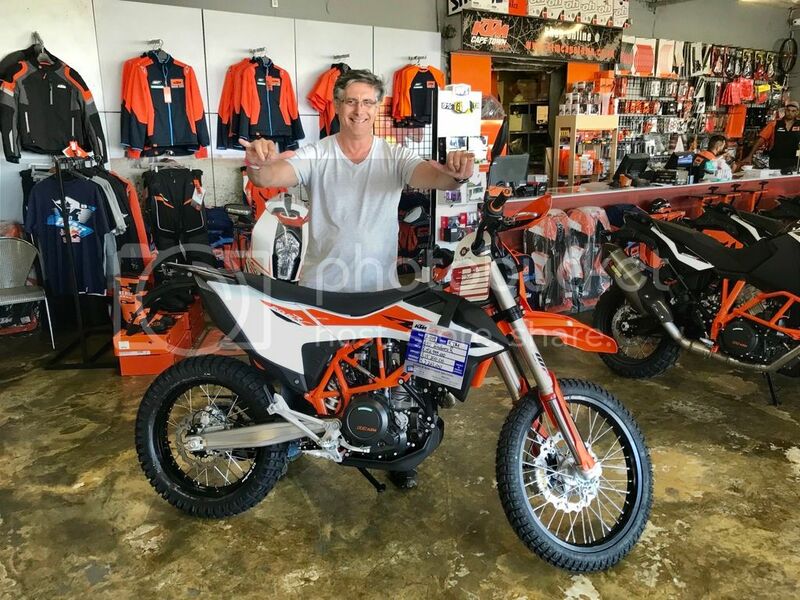 My understanding - can be wrong - is as I said, the current KTM has the old 690 engine with old engine head (because they didn't want to change the frame that new engine requires) and less power and more vibrations (and the rocker arm problem), while Husky 701 has since 2017 I think already the new engine. And I thought that the 2019 690 model gets finally the new engine - the same one that was in Husky since 2017. Have I got it wrong - I wasn't paying too much attention, so may have missed introduction of new engine to 690? The 2019 KTM has the similar engine as the original KTM Duke 690 from 2016 onwards, that's the same engine the 701 came out with later (2017/2018. It has a 13.5l fuel tank vs the 10.2l fuel tank of the 2018 model. Rocker arm bearings weren't an issue after 2015 models unless you were unlucky enough to get the few who still went through with the old stock - from 2016 on it should all be good.but should probably be a precaution replacement every 30 000km parts are cheap do it when you check valves. Mine was checked on 10 000km service and still perfect. Anyway back to the current one. 2019 engine would be a bit smoother (dual balancer shafts) and has a bit more kw, extra rpm up high a little less torque down low. Better front suspension same rear suspension. Lost the dashboard with gear indicator and Rev counter but has an easier ABS disable button. Has 2 riding modes and lean sensing ABS. Has a quickshifter as standard. Is R152k and there are 2 standing on the floor at KTM Cape Town. The seat didn't feel lower to me but it feels slightly broader than the 2018 model. The fairing in the front is really very nicely molded to fit my leg at leat. My knee fits exactly in the "indented" space. Beautiful bike. Actually you would mistake it for a new 350 exc-f/ 500exc-f at a very quick glance. People kept telling me what amazing bike the 690 was. I didn't believe them at first, they eventually convinced me, I got one, and now I'm telling you, the 690 is a seriously good and fun bike! This one seems even better! Yes the price is getting up there now, but I still think at R152k it's worth it for what this bike brings to the table.